English Section is one of the most important sections in Banking exams. It is easy to score in this section as it only requires basic knowledge. It does not require as much time as we give to other sections of IBPS Exam. Reasoning and aptitude part needs more hard work than English in IBPS Exam. So, scoring maximum marks in English Section will help in securing good overall results. 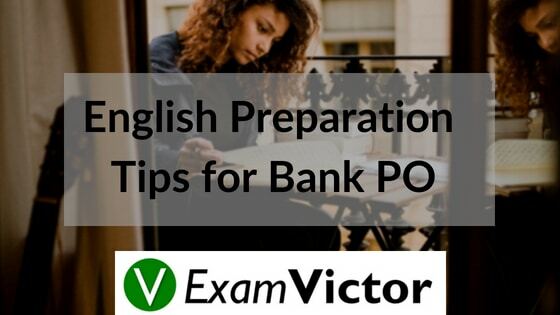 Reading Comprehension in Bank PO English consists of a passage and questions based on the passage. As the paper is online, you should go through the questions first and then read the passage. Once you read the questions, you will get some idea about the answers. Cloze test is a type of comprehension exercise in which the reader is required to add words that have been omitted from the passage. This has to be done by filling the blanks in passages and comprehensions and choosing words in a running passage to maintain the sequence of various sentences in the paragraphs. Sentence correction questions are based upon the fundamentals or basics of English language. This English section contains error detection. You will have to find spelling mistakes, grammatical errors, punctuation and others. Para Jumbles are important for IBPS English exam. In these questions, you have to rearrange the parts of sentences to form a meaningful sentence. We have provided a simple infographic to make you understand English Syllabus & Topics for Bank PO using pie-chart, bar-graph and mentioning some important topics. In this blog post, we have explained how different sections of English of IBPS PO Exam should be attempted. We have provided some tips which should be kept in mind while taking the Exam. For posts related to IBPS PO, check the link here. You can also check our Online Course Material for IBPS-PO through the link given.